The phrase “we should go fishing sometime”, grows in the same tree as, “I think I’m going to start working out”, or “I’d love to take your mysteriously single niece out on a date”. A hint of actual intention may be hiding in the branches, but it rarely materializes into any kind of fruit and no one seems too bothered by it. I have shared this all too familiar exchange with dozens of guys a guy I see almost weekly. Last week at a dinner party things escalated when days and times were mentioned. This raises the chances of actually fishing together by 50% at least. At this point, the intention wasn’t hiding in the trees anymore, it was making its way into plain sight on the end of a limb. T-minus 48 hours before the discussed outing. My soul coffin phone vibrates. Now, the idea of fishing together has fallen out of the tree and is running around in circles on fire. I hesitate because invitations like this commonly rescind, falling apart for one of a hundred reasons. Call me old fashioned but I just hate getting dressed for prom with no dance to attend. I love exploring new water. I enjoy meeting others that share interest and expertise in the sport. But the truth is, I find myself hesitant to throttle up in excitement when I know most people (and I am most people) have many competing objectives and commitments. And we should. In addition to anticipating the letdown, since leaving Nevada and my home water of the Truckee River, it’s a hell of a lot harder to get out and wet a line: the ask is bigger, the risks are greater, and the previous competency is irrelevant. I pull into the Bellevue Park’n’Ride at 5:03am and begin to transfer my weapons of war into Tim’s Rubicon Jeep. As his tailgate swings open, I see the folded vinyl material creased on itself across the back, clearly the inflatable raft he mentioned on the phone. 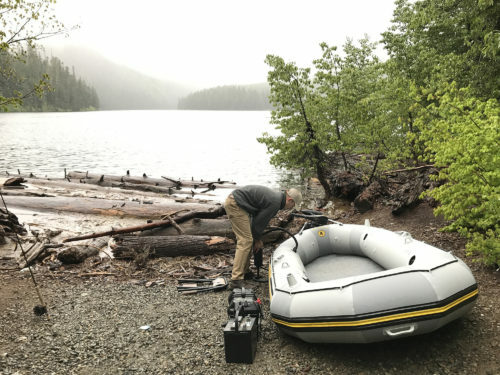 After a quick fuel stop, we arrive at the lake and back the Jeep down a shoddy unkempt boat ramp, one that terminated in a dozen massive limbless logs, blown from all edges of the lake to the ramp. It looked like Tom Hanks foiled attempts at escape in Cast Away. Thanks to physics, these behemoth trunks sulked away like sorry torpedoes with a stern shove of the hand. With a new temporary lane clear for our berth, we set out to my friend’s trusted coordinates. 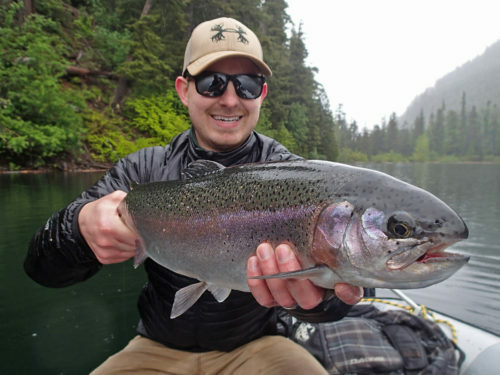 In our conversations leading up to the trip, he hadn’t mentioned that our tactic would essentially be sight-fishing toward the bank, watching for bruisers cruising along the shore. Interestingly, the water we were targeting (the closest 20 feet to the bank) would in any other year be shoreline, not cover for trout. The occasional fire-pit would pass under our boat, easily deciphered in the gin-clear water. 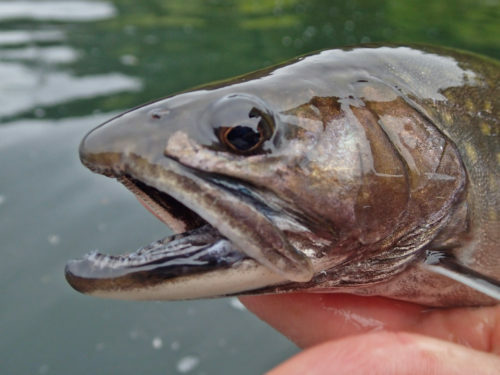 I had two goals from the onset: catch my first brook trout and not get skunked. That seemed a low bar given the reputation of the lake. A short while after making our first stop, Tim roped in a black-mouthed brookie. 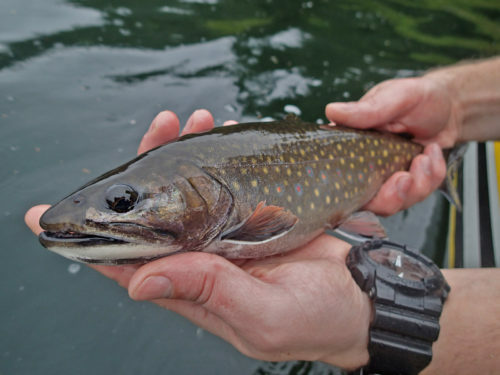 Technically, my goal involved me getting a brook trout, but hey, I’m a selfless guy so, yay for you. Tim got hefty bows to smash his streamer not once, but five times…he just couldn’t get the set quite right. After repeated grabs from the same fish, he hooked up and fought it calm and collected. 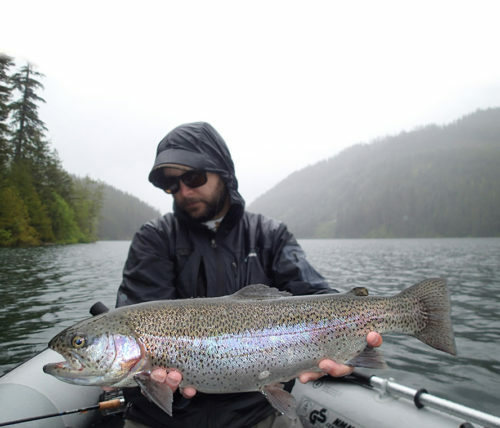 This picture below isn’t camera/arm trickery…it’s a 25″ rainbow. This brute was one of dozens we saw doing laps and hunting the shallows. Again, I’m trying to crack the goose egg, but I’m happy for you and the biggest trout of your life. Next round at the bar is on me. 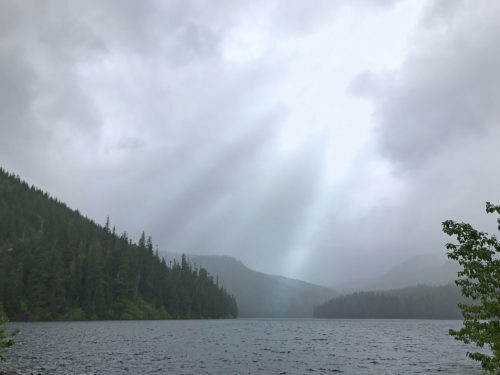 Of the 6.5 hours on the lake, we had a total of about 20 minutes that wasn’t actively pouring on us. The temps were low enough to make being wet more than a nuisance. I was striking out and painfully short of both of my goals. And before anyone lectures me on the merits of “just getting out there”, know that anyone who doesn’t think fishing is more thrilling while actually catching fish is either a liar, an awful angler, or too old to care. I am any of these things on a given day, but not today. The day was not shaping up to what I had hoped. Then it happened; the reason my grand-kids will likely hear about this day. Tim was fishing starboard side, while I was “trolling” a streamer on sink-tip on the port side while we followed the edge of the lake, the electric outboard gently pushing us along the bank. Tim commented on some structure against the bank we were approaching. I glanced over, setting my rod down to steady myself in the boat as I turned my torso. At this exact moment, my streamer grabbed something on the lake’s bottom. Something solid and unmoving. A tree stump, an old Volkswagen, a civil war era cannon…no one can be sure. My $1000 rod shot over the edge of the inflatable boat and landed flat on the surface of the water. An endless stream of commands poured out but Tim hadn’t seen what had happened and tried to understand what I was up in arms about. Within seconds, the weight of the 30 yards of sink tip took over and the whole thing was sinking. My door of opportunity was closing, and in ten agonizing and impossibly long seconds, I would hear the deadbolt latch in place. The rod was gone forever. We finally got the boat turned around and returned to the gravesite. Watching the horizontal line on the fish-finder creep downward was simultaneously fascinating and infuriating. I tried not to sulk, but thinking about not sulking probably looks a lot like sulking. I felt the weight of not wanting to be a wet blanket in an already soaked fishing expedition, but I’m betting my face told the whole story. I tried to keep fishing with a back-up rod, listless and moping. I somehow ended up hooking one fish, an identical twin to Tim’s beast from earlier. The stout planter numbed the sting of loss for a moment, but the awareness that I had lost a rod that I don’t have the financial margins to replace was like a swift kick to the crotch. I kept muttering these words, but they weren’t landing. Not yet anyway. We cruised back to the ramp, and began to disassemble the boat. Something about the air hissing out of the compartmentalized bladders captured the moment perfectly. Part two of this story found here. 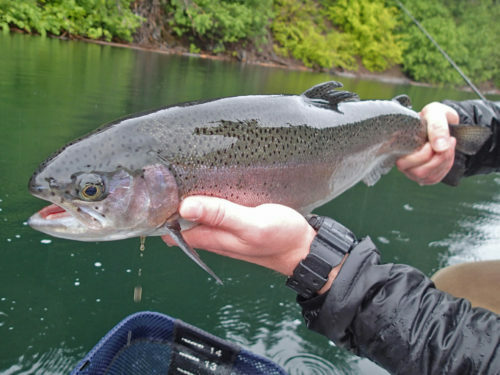 This entry was posted in catch and release, fly fishing, pacific northwest, rainbow trout and tagged brook trout, central, dropped, lake, lost, pnw, rainbow trout, rod, wa. Bookmark the permalink.